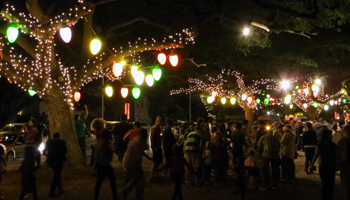 Every December, Honolulu City Lights Bring Holiday Cheer to Hawaii. 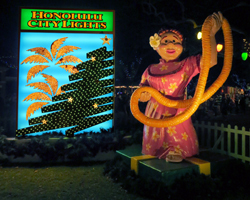 Honolulu City Lights: Celebrate Santa's Hawaii Vacation! Where does Santa go to escape the frigid North Pole winters? Well, every December since 1985, he has enjoyed a Hawaii vacation checking out the Honolulu City Lights holiday displays at Honolulu Hale. 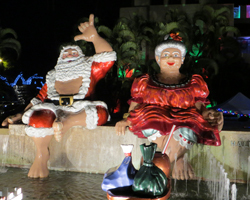 Santa and Mrs. Claus arrive on the first Saturday of the month; and, every day until New Year, you can see them soaking up the warm December sun while cooling their feet in the fountain outside our City Hall! If you’re here for the holidays, you too might really enjoy these seasonal Hawaii attractions. That’s when the City and County of Honolulu and the Friends of Honolulu City Lights volunteer organization celebrate the season at City Hall (and at adjacent City and County buildings) by lighting up a 50-foot (15 m) Cook Island Pine tree and embellishing the surrounding area with thousands of tiny Christmas lights and dozens of larger-than-life Holiday decorations! 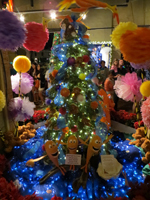 Then, on display inside Honolulu Hale for all to admire, they deck the halls with all the entries in a wreath making contest; and the city agencies exhibit their creativity in a Christmas tree decorating contest! The theme changes every three years, so there’s always something new to enjoy. 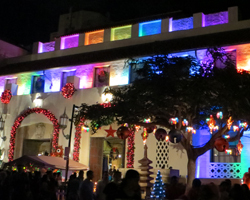 On the first Saturday in December, starting at approximately 6pm, the month-long seasonal celebration kicks-off when they light-up the outside tree and start the Public Workers Electric Light Parade, which runs along King Street from River Street to Kawaiahao Street. 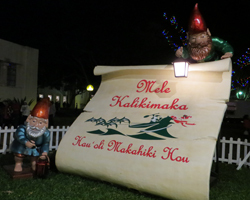 By approximately 6:30pm all the holiday lights are lit, and the exhibits inside Honolulu Hale are officially open. Then there’s usually free entertainment and free pictures with Santa Claus. I’ve been to only one or two other Christmas parades elsewhere, so I can’t claim to be an expert on these events, but they all seem fairly similar to me (ours is just warmer). Furthermore, the crowds and parking situation are already somewhat overwhelming on the other nights. On opening night, these challenges increase exponentially (approximately 75,000 people in attendance). So, if you’re going to be there on opening night, I’d take TheBus, or get there early. There are usually children’s activities/rides and food/souvenir booths open as early as approximately 4pm to help you pass the time. And besides… it’ll be a bright Hawaiian December day! You can sit outside for hours and enjoy it thoroughly – no freezing here! City vehicles decorated with lights and more (TheBus, utility trucks, fire truck, police vehicle, construction truck, etc). High school marching bands and the Royal Hawaiian Band. The whole album is good; but Willie K's version of O Holy Night is one of the two best I've ever heard, and I'm getting goosebumps just writing it. Meanwhile, his versions of Little Drummer Boy/Ring Your Christmas Bells and Unto Us is Born a King are both amazing. But the award for most incredible Christmas song ever - Hawaiian or otherwise - probably has to go to the Cazimero Brothers for their version of Angels We Have Heard on High. Nothing compares. The whole album is enchanting; and it's also bittersweet since Roland Cazimero recently passed. He will be missed. Primarily because of the crowds, I seldom make it a point to go see the Honolulu City Lights on opening night. But this works for me because I go more for holiday tradition than for an actual event. And most everything I want to see – the lights, tree displays (left), and wreath contest exhibit (below left) – is on display for the full duration of the event anyway. As a result, I usually wait until later in the month (when there are only thousands of people instead of tens of thousands). I mention this because your Hawaii vacation dates might not include the first Saturday in December. That’s okay. There’s still plenty of holiday cheer on every other night. You won’t be getting any coal in your stocking by missing one day. If you’re a Christmas ornament collector (like I am), the volunteer organization sells specially-commissioned theme-related ornaments each year since 2000. They’re not cheap, but they are quite nice and truly unique to Honolulu. If you’re an ornament collector, neither of these facts will surprise you. Personally, my favorite designs are the 2013 Santa Surfing Waimea and the 2012 Santa Snorkeling Hanauma Bay. You can purchase these ornaments at Honolulu Hale or online from the Friends of Honolulu City Lights (link opens a new window/tab); and I’ve heard that they are also available for purchase at Oahu Macy’s stores. 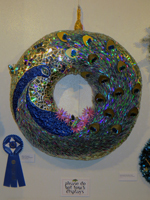 Proceeds from the ornament sales help fund each year’s event. Mele Kalikimaka and Hau’oli Makahiki Hou (Happy New Year)! This sure beats snow!